It is an honour for me to be present here today for the International Literacy Day, 2013. I compliment the National Literacy Mission Authority for organizing the celebrations marking this important occasion. It is indeed a proud moment for us that India has won the prestigious UNESCO King Sejong Literacy Prize this year. I would like to take this opportunity to congratulate the National Literacy Mission Authority, State Literacy Mission Authorities and all other literacy functionaries for their dedication and untiring efforts. Literacy is a basic human necessity. It is a cornerstone for all categories of education, including life-long learning. It plays a key role in sustainable development resulting in peace and harmony. 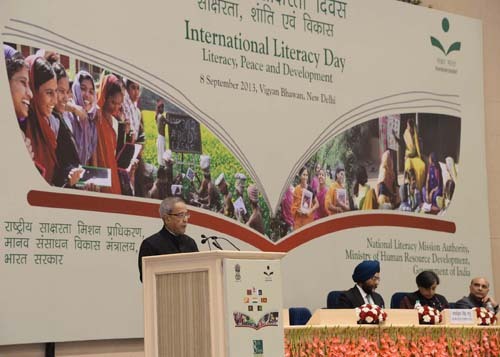 I am happy that this understanding is sought to be reinforced with the International Literacy Day being observed in India this year with a special focus on "Literacy, Peace and Development”. In our development discourse, the link between these three parameters is probably not emphasized to the extent it deserves. Most conflicts in our country, and outside, has its roots in the manipulation of ignorant minds and the distortion of information. It is easy to induce illiterate or uninformed individuals and build misperception in their minds. They are susceptible to mental conditioning. The propensity for conflict is higher as they can be influenced easily. On the other hand, a literate mind contributes to processes aimed at peace and development. The individual capacity to think increases through the knowledge of letters. Higher level of literacy leads to greater awareness. It can help people acquire new skills leading to prosperity and development. A literate society has a better quality of life, particularly life expectancy, infant mortality, learning levels and nutritional levels of children. The International Literacy Day is celebrated this day every year throughout the world. It is an occasion to create greater public awareness about this social ill and to mobilize public opinion in favour of the continuing struggle against illiteracy. It also serves to renew our commitment towards its eradication. It is gratifying to note the steady progress made in literacy levels in our country after Independence. The literacy rate has increased by four times from eighteen per cent in 1951 to seventy four per cent in 2011. Despite this, our literacy rate is below the world average of eighty four per cent. The reasons are not very hard to decipher. A huge accumulated backlog of non-literates makes the task of achieving a significant rise in literacy rate harder. The time has come to put in renewed vigour and concerted efforts to improve our literacy rate. It has been envisaged that by the end of the Twelfth Five Year Plan period, we would achieve eighty per cent literacy rate and also narrow the gender gap from sixteen to ten percentage points. Our ultimate objective should be to bring the literacy rate not only at par with the world average but the levels attained by the leading nations. The existing gender disparity in literacy levels has to be bridged by turning our attention on girl child and women. Our attempts at achieving wide-spread literacy should be complemented by efforts at alleviating poverty, mitigating inequity owing to gender and social category, and improving access to schooling. We have to gear up the machinery at all levels – national, state, district, block, and gram panchayat. The implementation structure has to be strengthened by involving government agencies as well as reputed organizations in the non-government and private sectors. With the active participation and commitment of all stakeholders particularly literacy functionaries, I am confident that we will achieve these targets. Several debilitating factors have hampered our progress in literacy, especially adult literacy. This had underscored the need to embark upon a tangible plan. Recognizing this imperative, the Government had launched the Saakshar Bharat program on this very day, four years ago. This Initiative was aimed at establishing a fully literate society through improved standards of Adult Education and Literacy. 70 million adults in the age group of 15 years and above were the primary target for imparting functional literacy under this programme. The Adult Education Centres at the gram panchayat level were made responsible for teaching - learning activities at the grassroots level. The National Institute of Open Schooling (NIOS) was entrusted to conduct learner’s assessment and give certification for basic literacy and education equivalent with the formal education system. I am told that more than 20 million learners have already been certified as literate. The success of the adult education programme will depend on how well it can adapt to emerging changes. Instead of functioning as a transient agent, this Mission has to take the shape of a regular and permanent mechanism. Such machinery should be established and sustained at the level of various administrative authorities, and also civil society organizations, social partners, community, private sector, and adult learners’ and educators’ organizations. In our fight against illiteracy, we have to create greater public awareness and opinion about this scourge. Through meaningful advocacy, we have to create, amongst those who are unable to read and write an inner urge to become literate. The success of our literacy programme ultimately depends on the willingness and cooperation of the people. I call upon each and every citizen of our country to take up this challenge and contribute in making our country free from the clutches of illiteracy. With this, I extend my gratitude to the distinguished delegates for participating in this function. I wish you all the very best.